News: The book has now been updated to a new 2nd Edition in English, French, and Spanish, along with a brand new packet of Type II Braces. Thank you to Michiel Steenbeek for spearheading all of these updates. The Steenbeek Foot Abduction Brace (SFAB) is a device to maintain the extreme foot abduction (70 degrees) in children with treated clubfeet. The SFAB forms an integral part of the Ponseti Method of Clubfoot treatment, which targets new-born babies with Clubfeet. Correction of the Clubfoot is achieved by applying serial casts of p.o.p., in combination with a minor surgical procedure (percutaneous tendo achilles tenotomy for 90% of the babies) under local anaesthesia. The SFAB is necessary to maintain this correction. 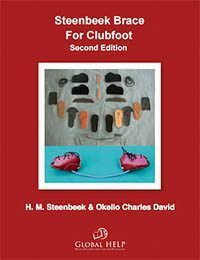 Originally printed in 2004, "Steenbeek Brace For Clubfoot" was updated in 2006 and now, with the 2nd Edition, 2009.